Fetch Brewing Company is a microbrewer, offering craft beer brewed on site, in this uniquely converted historic bank. Relax in the penny-tiled vault, or enjoy the tap room, outdoor seating, welcoming atmosphere, and live entertainment! This is a food-friendly establishment. Feel free to bring in any outside food you wish or use our local restaurant menus to get take-out or have a pizza delivered right to your table. 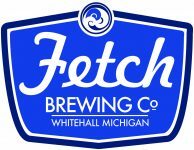 Fetch Brewing Company is a Pledged Green Network Business member.